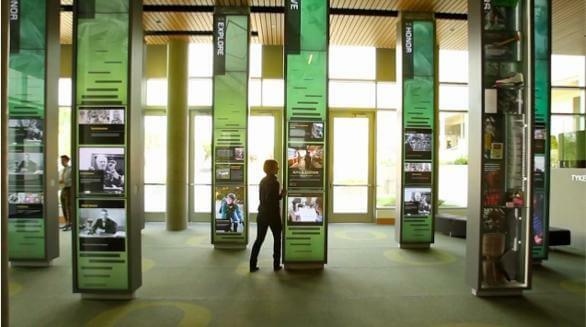 Installations like this one at the University of Oregon show the potential of massive touch surfaces produced using Visual Planet's touchfoil technology. Open up a cardboard tube, roll out a transparent film just millimeters thick, apply it on a flat object and *tada* you’ve got an interactive touch surface. Cambridge-based Visual Planet just launched its new massive-sized multitouch thin film drivers so you can create touchscreens from 30 to 167 inches in size! Their touchfoil is a transparent nanowire embedded polymer capable of sensing the touch of a finger, or even pressure from wind and translating that to a computer interface. It works on glass, wood, and other non-conductive surfaces. Along with their many partners, Visual Planet can ship a custom built film (almost) anywhere on the planet and help you create a unique interactive display that will turn heads and hold attention. Check out some of their many applications using LCD screens, rear projection, and more in the videos below. Is this proven technology just a novelty, or will it help transform our environment into a digital wonderland? I have to start with some of the impressive demonstrations Visual Planet and its partners have created. Over the past seven years they’ve installed “thousands” of these surfaces around the globe. The first is a simple LCD monitor that has been covered in the touchfoil (aka the “ViP Interactive Foil”). Multitouch like this can be produced at sizes up to 60 inches. Single touch goes all the way up to 167 inches, as you’ll see in the second video. The general appeal, and versatility can be seen in the third video, taken at an installation in Oslo. With their launch of the multitouch drivers, Visual Planet is helping expand its user base by including Windows 7 compatibility and courting developers with an SDK. Their fairly new website also highlights how they can work with their partners to provide you with a custom solution from distribution of the film to installation to software development. Their YouTube channel is also chock full of videos showcasing tons of different use-cases and sizes. Basically if you have a display (LCD, projection, etc) and you have a surface (store front window, support column, floor, etc) Visual Planet can turn it into a touchscreen. That’s impressive, but it’s also old news. Visual Planet has been installing these films for years. If you’ve read Singularity Hub regularly (which causes much less brain cancer than you would think) you may remember our earlier coverage of Displax. The Portuguese company did many of the same demonstrations. That makes sense as they were one of Visual Planet’s partners. There are true competitors, however. 3M has had a similar technology for years, and as you get into smaller sizes the number of available solutions skyrockets. Which makes me very curious as to why we don’t have more of Visual Planet-style interactive surfaces out in the world. Thousands? Sure, that’s pretty good for an emerging technology, but honestly most of us probably won’t see these devices regularly until there are millions. What’s the hold up? I’m not sure large touchscreens are the right tool for the job. They are uniquely impressive, I’ll give you that, but having seen a few in malls (as maps) or in kiosk ads (with games to attract viewers), I think there are too many drawbacks. They get grimy (who wants to touch something everyone else has touched? ), they can get worn, they are locked into place, and your use of the technology is very public. People are going to watch what you’re doing. Compare that to augmented reality on your smart phone. You get similar levels of touch interaction with the real world, just on a smaller, more personal scale. Less impressive? Maybe, but it lets people find the information, and interact with it, on their own terms. To me, AR is going to be the more desirable solution for the majority of use cases. So…yeah. That leaves me with this amazing looking technology whose applicability is somewhat questionable. Huge screens you can touch? Sounds amazing, but for now I think it will remain a novelty. Applications that draw attention – like an interactive touchscreen bar in a pub – will probably work well. Applications that want to be really useful – I think we’ll just go with our phones instead. But maybe I’m wrong? Tell me what you think in the comments. Visual Planet has definitely made its technology as accessible as it can, now it’s up to all of us technophiles to decide whether or not we really want it.